Leg pillows are the key to solving your lower back pain. I used to go to the chiropractor at least 4 times per month and this went on for over a year. I loved going to the chiropractor and I felt so much better once I was realigned. Having a sedentary lifestyle is hard on your back just like standing. My neck and my SI joint were always the most problematic. If you are starting to feel pain in your lower back, you have to make changes in your life. Pain is a symptom of a problem and that issue is not going away unless you address it. I addressed my pain with a leg pillow. My lower back no longer hurts like it used to. My hips no longer annoy me when I sleep. I am a side sleeper. Side sleepers will have pain if they don’t keep their spine aligned. Any area of pressure will hurt over time. As you continue to sleep on your side night after night, your hip slowly starts to burn from the unnatural position and pressure its receiving. Back and stomach sleepers are more evenly distributed and see this pressure pain less unless they are on a mattress that has lost support. Latex mattresses will last 20-25 years while memory foam will last 10-15 years or less in some cases. If you are waking up sore multiple nights in a row, chances are you need to upgrade your mattress. SI Joints are located in your lower back. If you have ever placed or been told to put a pillow between your legs, this procedure directly helps keep the lower spine aligned. 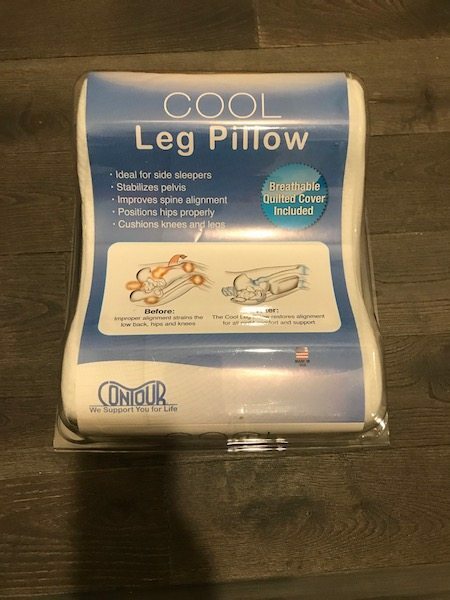 While a regular pillow will help some, a leg pillow made directly for fitting between the knees and this type of condition will help you immensely. A regular pillow is made for the neck and head not the thighs and knees. The best results come from leg pillows. What kind of leg pillow should I get? I have tried several different leg pillows. Contour has been the highest quality and is very reasonable on price. How often should I use the leg pillow? I use one every night. If I don’t sleep with a leg pillow, I will notice a significant difference in my lower back. The leg pillow saved me thousands in chiropractor fees. Me personally…. Not someone I know. Back pain is debilitating. It will make life very unpleasant. Try out a $20 dollar leg pillow and change your life. Check out more leg pillows here…. ← Dunlop vs Talalay Latex: Which mattress is best for you?